Hey there! So, I recently bought a V2 to replace my old X2 as my main head, but I figure rather than waste a decent head, I could experiment and create new possibilities. Like using the X2 to boost the V2 (or vice versa) since I would probably buy an overdrive pedal anyway. Yeah, I know what happens when you layer multiple levels of gain, but I don't really want a super high gain sound anyway. I would probably use the clean channel or just a tiny bit of gain. Using the X2 for its cleans might be a good idea anyway seeing how the V2's clean channel doesn't have an EQ (and supposedly Dimebag used it for its cleans anyways). I've also considered running them in stereo. I noticed the Warhead cab has stereo inputs. Then I could do something like Piggy and use a delay pedal with stereo outputs to make a phaser-ish effect right? I mostly just don't know how to do any of this safely because I know very little about ohms or anything like that. Any tips or ideas are welcome. Thanks guys! I just wanted to clear this up for the Dime fans out there. 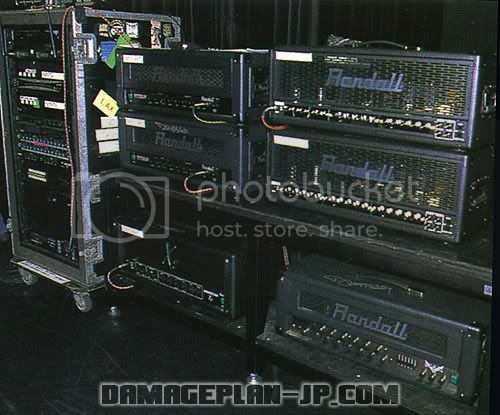 Dimebag did not use the X2 for cleans. 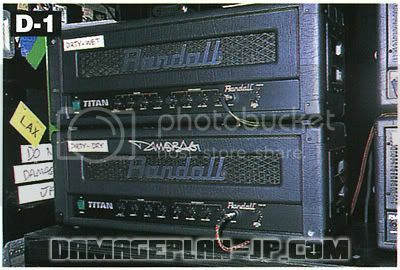 Right before he went to Krank he used 2 titans in a wet/dry configuration in addition to a dry X2 for his dirty sound. 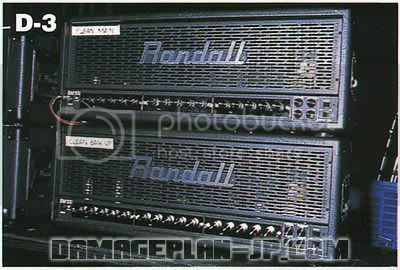 He used a Randall RM100 for his clean sound. The second RM100 in the picture is for backup.